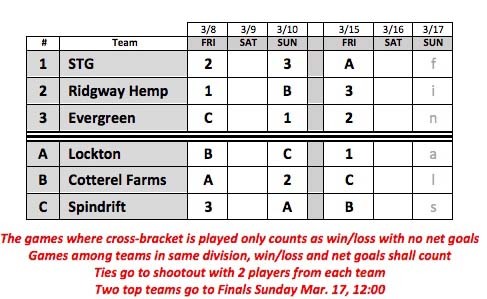 Cotterel Farms has 2 wins, beating both Lockton 14 to 3, and Ridgway Hemp 8 to 6. Spindrift also has 2 wins. They defeated Evergreen 11 to 10, and Lockton 10 to 9. Evergreen has 1 win,victorious over STG/Chapel Hill 14 to 6, and a loss to Spindrift 11-10. Ridgway hemp has 1 win,losing to Cotterel Farms 8 to6, and a win against STG/Chapel Hill 12 to10. STG/Chapel Hill has 2 losses, being out-scored by Ridgway Hemp 12-10, and Evergreen 14-6. Lockton also has 2 losses, defeated by both Evergreen 14 to 9, and Cotterel Farms 14 to 3. Cotterel Farms won the featured 8-Goal match on Sunday. Trophies were presented by representatives from G.H. Mumm. From left to right: Francisco Guinazu, Max meninx, Francisco Benardoni and Jenny Benardoni. Empire has 2 wins, victorious over both Cedar Creek 9 to 4, and La Luna 7 to 4. Hanalei Bay has 2 wins, defeating La Luna 8 to 4, and Cedar Creek 11 to 6. Cedar Creek has 2 losses, losing to Empire 9 to 4, and Hanalei Bay 11 to 6. La Luna has 2 losses, beaten by Hanalei Bay 8 to 4, and Empire 7 to 4. The March 10th 1-goal League had 2 flights and seven teams. A flight winners were Taurus, (Kristen Armbruster -1, Sierra Dunbar -1, Ian Schoebelen 0, Robert Payne 3), who out-scored CPC/PPT, (Frank Li -1, AlexR/Ryan Kotten -1, Eugenio Vidal 1T, Alejandro 2) with a 6 to 3 win. The B flight round-robin was won by C.P.C. Smarty Pants, (David C./Katty Wong -1, Chris Chun -1, Kirsten Ludwig 0, Craig Russel 2), defeating Flaming Chickens, (Joey Gallemore -.5, Elise Pardue -1, Hayward Pardue 0, Ricardo Garcia 2) and Columbia West, (Ana Wilson -1, David Barnett -.5, Toto Socas 2, Rafael Hernandez 0). CPC Smarty Pants- Katty Wong, Kirsten Ludwig, Craig Russell, Chris Chun, David Chun. Vashon from left to right: Eileen Duffy, Stephanie Davidson, Mariano Gutierrez and Kim Bergman. The March 3rd 1-goal Leagure final’s winner was Vashon, (Stephanie Davidson -1, Kim Bergman -1, Eileen Duffy -1, Mariano Gutierrez 4). 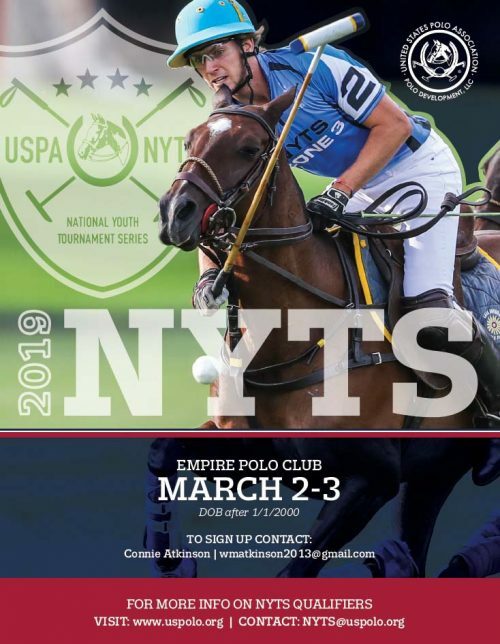 Join us for the first weekend of 4-Goal USPA Congressional and 8-Goal USPA Constitution Cup Games. Teams and draws are included below for each league. 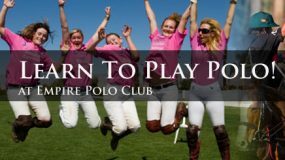 We have Friday night “Polo Under the Lights” this Friday, March 8th at 5:30 PM on Field #3. Admission and parking are free on Friday nights. No VIP seating is available at the night games. 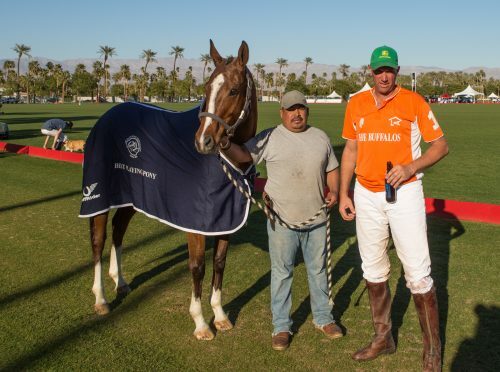 Sunday Polo starts at noon on Field 1. General Admission and parking are $20 per car and gates open at 10 AM. VIP seating is sold out for the next three Sundays. We still have a few seats left on March 31st. 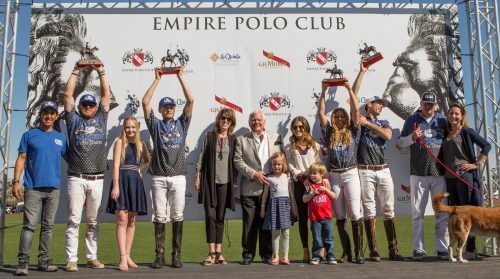 To request VIP reservations for the final day of Sunday Polo, contact Tony Schieffer at tonyschieffer@empirepolo.com or call 760-393-7298. Lockton, (Tim Kelly 0/Athena Malen 0, Tommy Costello 1, Andres Gonzalez 2, Shane Rice 4) went to battle against Ridgway Hemp, (Beau Stanley -1, Meghan Gracida 0, Carlos Hernandez 4, Memo Gracida 5) in the finals of the 8-goal Patton Cup. The game began with a one point advantage for Lockton by handicap. Beau Stanley’s goal erased that lead, ending chukker one in a 1 to 1 tie. 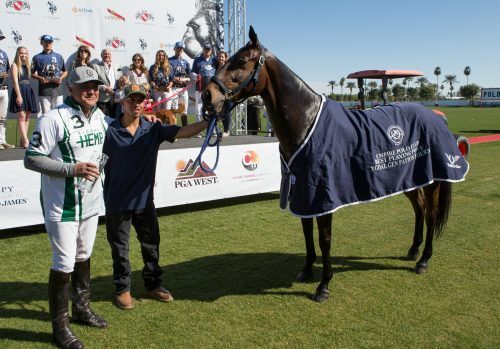 Lockton’s Costello, Gonzalez, and Rice each scored a goal and out-scored Ridgway Hemp’s Memo Gracida’s two points in the next chukker, ending it with Lockton leading, 4 to 3. 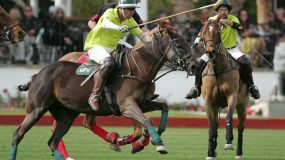 Hernandez got loose for two back to back goals in the third chukker, which Gonzalez answered with his impressive, back to back runs to goal. Shane Rice followed with a successful penalty three shot, sending the teams to half-time with Lockton maintaining their lead 7 to 5. In the fourth chukker Hernandez and Memo capitalized on two penalty shots bringing the score to a brief tie at 7 to 7. Athena Malen joined Lockton and broke the tie with a gorgeous run to goal putting Lockton back into the lead to end chukker four, 8 to7. Hernandez scored a penalty two and the game was again tied 8 to 8. The Lockton team stated to pull away when Gonzalez added two points and Rice one point. 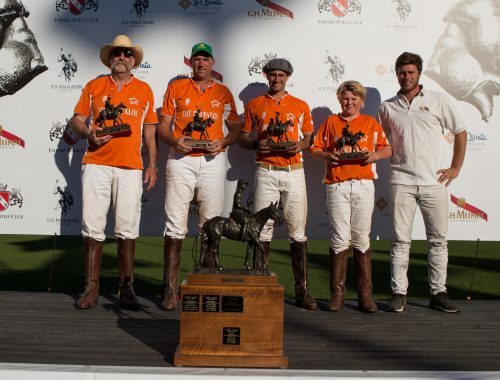 Chukker six started with 11 to 8 on the score board and the game ended with Lockton increasing their lead, and winning 13 to 8 after Athena Malen and Shane Rice put two more points up for Lockton. 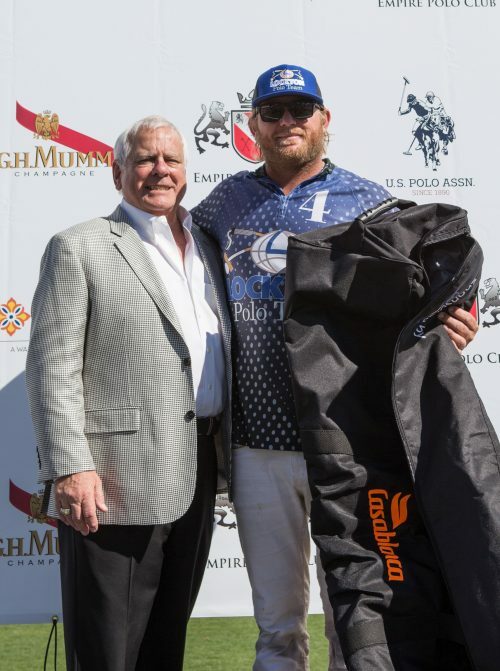 Lockton won the 8-Goal USPA Gen. Patton Finals. From left to right: Shane Rice, Ally Holbrook, Tommy Costello, Andi and John Crespy of Raymond James, Olive, Hollis and Gail Crespy. Thank you John Crespy of Raymond James for presenting the trophies. 8-Goal MVP: Shane Rice. Trophy presented by John Crespy of Raymond James. In the 4-goal Patton Cup Buffalos, (Piers Bossom -1, Ross Adam 0, Felipe Sordelli 2, Tim Rudy 3) took on Hanalei Bay, (Krista Bonaguidi -1, Joe Coors 0, Ignacio Saracco 2, Luis Saracco 3). Hanalei Bay jumped to a lead, scoring the only two goals in chukker one. Tim Rudy came back in the second chukker with three goals, ending chukker two with Buffalos leading 3 to 2. Rudy and Adam each added a point in the third time period. 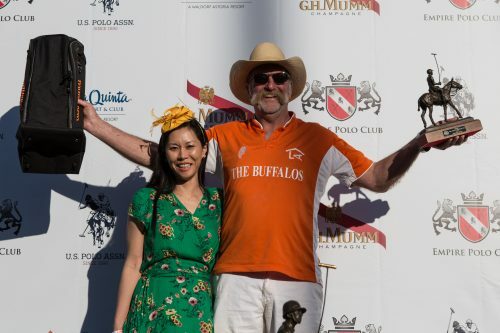 In the fourth chukker, Joe Coors scored a penalty shot for Hanalei Bay and the Buffalos racked up four more points, ending the time period 9 to 3. Luis Saracco closed the lead in the fifth chukker by scoring twice but the win went to Buffalos with a final score of 9 to 5. 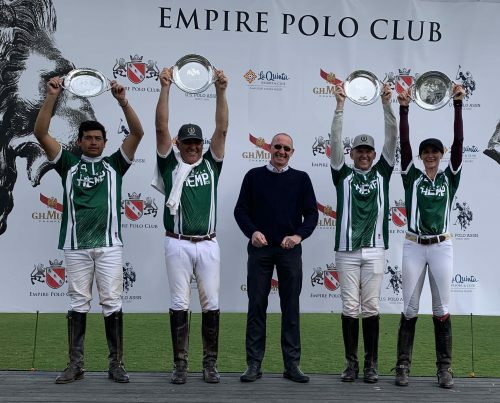 Buffalos won the 4-Goal USPA Gen. Patton Tournament. From left to right: Ross Adam, Tim Rudy, Felipe Sordelli, Pieres Bossom and Leandro Floccari. 4-Goal Best Playing Pony Chrome, a mare owned and played by Tim Rudy. From left to right: Chrome, Reana Patino and Tim Rudy. In the A flight Finals of the 1-Goal, CPC Pasadena, (Rick Karayan -1, Melanja Jones 0, Tom Schuerman 0, Domingo Questel 2) was up against Vashon, (Kim Bergman -1, Stephanie Davidson -1, Croix Waage -1, Mariano Gutierrez 4). The game was fast and furious, ending in a 5 to 5 tie which CPC Pasadena won in a shoot-out. 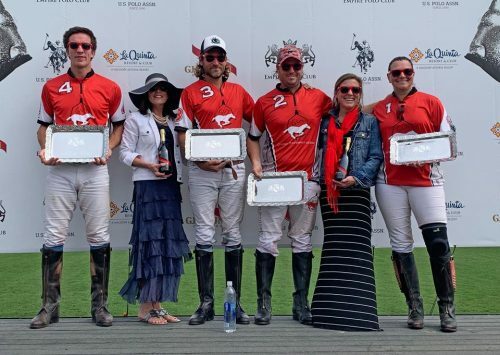 The B flight Finals of the 1-Goal was a round robin between Arizona Polo, (Amelia Perry -1, Martin Morey -1, Dan Faherty .5, Martin Gonzalez 2T), Vancouver, (Paul Sullivan -1, Benson Hurlbutt -1, Grant Lockhart -1, Nicolas Maciel 3), and CPC Smarty Pants, (David C./ Katty Wong -1, Chris Chun -1, Kirsten Ludwig 0, Craig Russell 2). 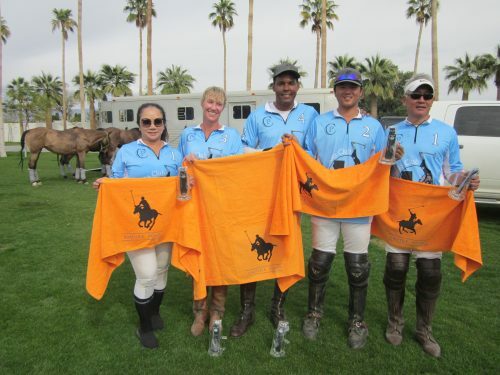 CPC Smarty Pants beat Arizona Polo 9.5 to 1. Vancouver out-scored Arizona Polo 8.5 to 5. Vancouver was able to end up winning their game against CPC Smarty Pants, with a final score of 6 to 5. 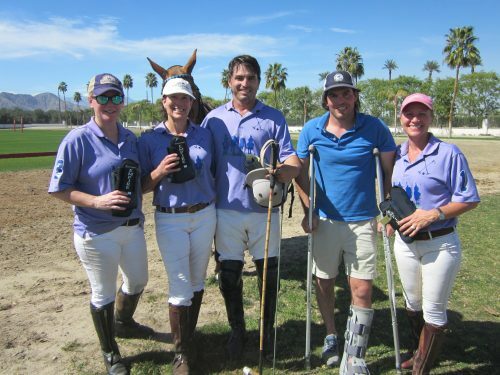 Four teams played this weekend in Empire Polo Club’s 8-goal USPA Gen. Patton Tournament. STG, (John Ziegler 0, John Bickford 1, Leandro Flocarri 2, Martin Jauregui 5T) went up against Lockton, (Tim Kelly 0/ Athena Malin 0, Tommy Castelllo 1, Andres Gonzalez 2, Shane Rice 4). Shane put Lockton in the lead with the first goal of the day, (his first of six). 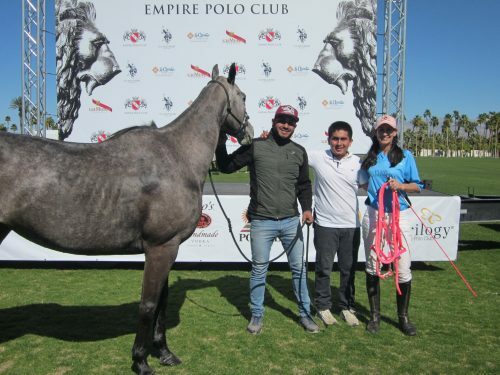 STG’s Jauregui set the game’s competitive pace with chukker one’s second goal, (his first of seven). Lockton outscored STG in the next two time periods, sending the teams to half time: Lockton 8 to STG 5. Athena Malin substituted in for Tim after half time and made a gorgeous goal . Rice and Juaregui each scored once, ending chukker four with Lockton increasing their lead 10 to 6. STG fought back with four more goals, while Lockton added two more points on the board. The match ended with Lockton maintaining their lead, 12 to 10. Ridgway Hemp won Sunday’s match. 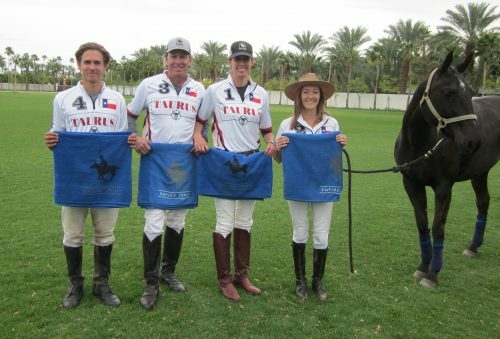 From left to right Carlos Hernandez, Memo Gracida, Beau Staley and Meghan Gracida. 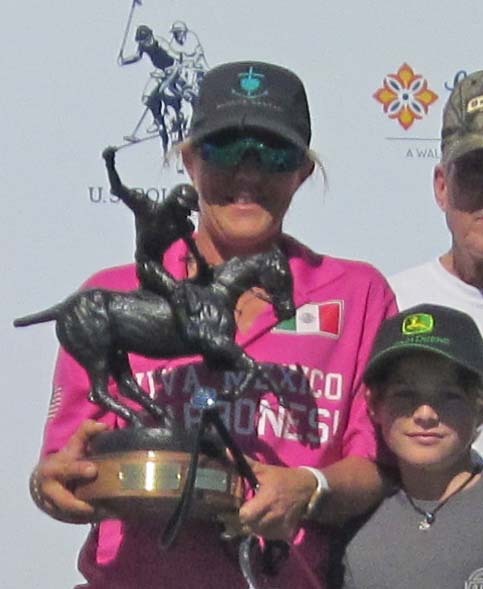 Trophies were presented by La Quinta Resort and Club. Sunday’s afternoon 8-Goal Gen. Patton game was a great match between Chapel Hill, (Torry Repinski 0, Bayne Bossom 2, Juan Jo Gonzalez 3, Robert Payne 3) and Ridgway Hemp, ( Beau Staley -1, Meghan Gracida 0, Carlos Hernandez 4, Memo Gracida 5). The first half was Ridgway Hemp’s time to jump to a 4 to 0 lead. Juan Jo Gonzalez came out shining in the second half closing the lead with a goal in the fourth and fifth chukker. Payne added one in the fifth, and RIdgway Hemp was held scoreless in both chukkers. Players came to the sixth chukker line up with the score, Chapel Hill 3 to Ridgway Hemp 4. Chapel Hill’s Gonzalez racked up two points, and Ridgway Hemp rallied with three goals, ending the game Ridgway Hemp 7 to Chapel Hill’s 5. 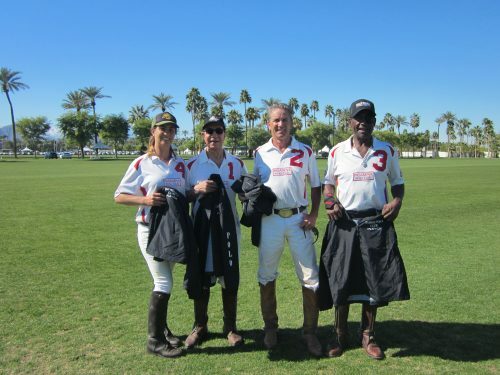 Four teams are competing in the 4-Goal USPA Gen. Patton Tournament. Hanalei Bay, (Krista Bonaguidi -1, Joe Coors 0, Ignacio Saracco 2, Luis Saracco 3) took on Evergreen, (Tom Sprung -1, Quinn Evans 0, Carlitos Galindo 3, Taylor Freeman 2). The first chukker was an even match and ended 2 to 2. In the second chukker, Hanalei Bay accumulated five goals to Evergreen’s one. The momentum continued in the third time period, which ended with Hanalei Bay leading 11 to 6. Evergreen out-scored Hanalei Bay in the second half, but did not close the lead. The final score was Hanalei Bay 13 over Evergreen 9. The Buffalos, (Piers Bossom -1, Ross Adams 0, Leandro Flocarri 2, Tim Rudy 3) took on Columbia West/Vancouver, (David Barnett -.5, Jay Garnett -.5, Toto Socas 2, Nicolas Maciel 3). David Barnett was the first to score, followed by Piers Bossom. Toto and Rudy each added a goal, ending the first chukker tied, 2 to 2. Buffalos scored two unanswered goals in the second chukker, putting them in the lead 4 to 2. Columbia West/Vancouver’s Joe Garnett and Socas each put one through the posts in the third time period. Ross Adams and Rudy came back with three points, sending the teams to half-time with Buffalos leading 7 to 4. Each team made three more goals, making the end result Buffalos 10 to Columbia West/Vancouver 7. The finals for the Debii $$ Conant Women’s Tournament was between Zephyr/M3, (Claudia Uretz 2, Erin Brittan 2, Madelyn Cobb 4, Cybel Jordan 4) and Plank&Co./Medexpert, (Micaela Saracco 0, Kristen Hiller 2, Dayelle Fargey 6, Kendall Plank 4). Dayelle came out swinging and put three points on the board for her team, which ended chukker one, 3 to 0. 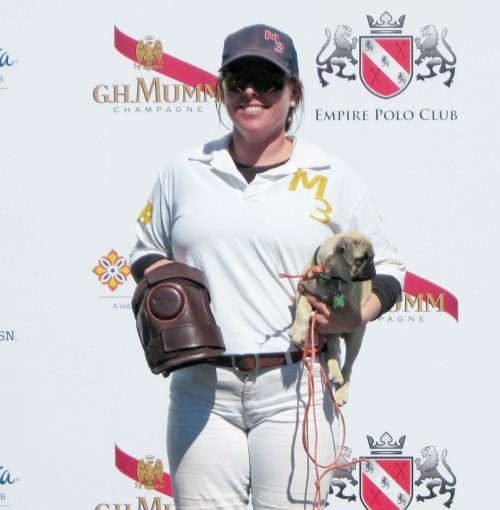 Madelyn Cobb scored twice for the Zephyr/M3 in the second chukker, and Kristen Miller added one. The score at half-time was 4 to 2. Zephyr/M3 out-scored Plank&Co./Medexpert in the second half, but Plank&Co./Medexpert won 7 to 6. They also celebrated Maceala’s 12thbirthday!! Kendall Plank, Dayelle Fargey, Kiki Hiller, Micaela Saracco. The consolation match was won by Lazy H Ranches, ( Jasmire Trotz 0, Julie Fernandez 2, Athena Malin 4, Catlin Dix-Harris 4). 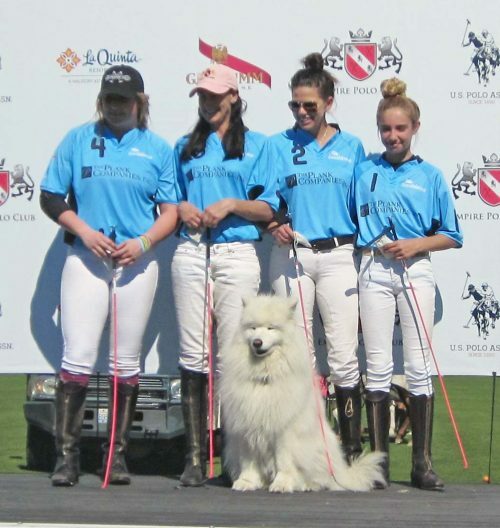 They out-scored Manolo Polo, (Becky Schaller 2, Shannon Mendez 2, Anna Coscia 4, Audrey Persano with a final score of 4 to 2. Best Playing Pony- Peace, owned and played by Dayelle Fargey. Julie Fernandez won the Dorrie Forstmann Sportsmanship Award.